My veggie burrito bowls are still one of the most popular recipes on this blog, even now, 3 years later. Not to blow my own trumpet or anything (except that I totally am), but I still get pretty regular comments about how much people enjoy the recipe. That’s how I know you guys are my soul mates – anything with spicy black beans, covered in melted cheese, you love about as much as I do. 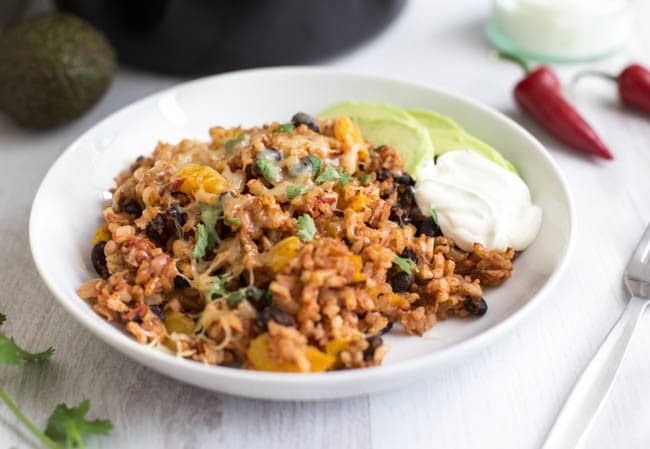 I’m hoping that you’re also as lazy as I am (read: pretty damn lazy), because I thought it was time to revamp my old burrito bowl recipe into a version that’s even easier, even quicker to prepare, and just as delicious (the italics make it extra true). 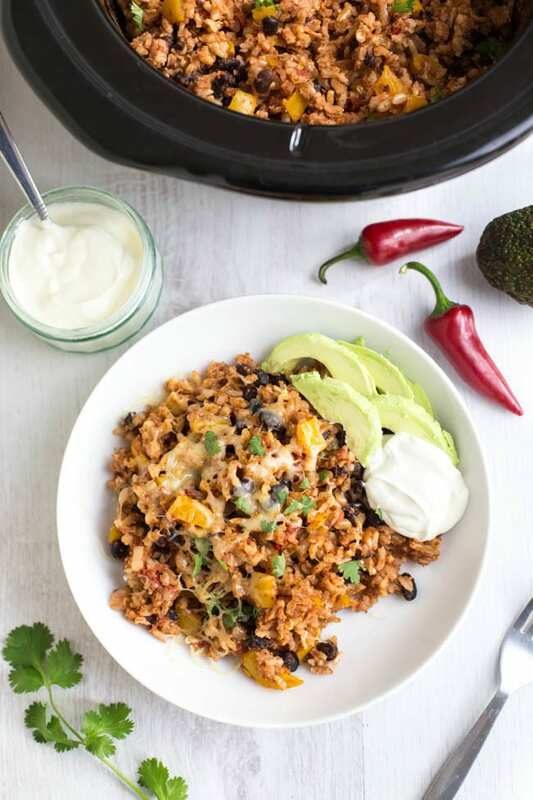 That’s right, I bring you slow cooker burrito bowls! Huzzah! 1. Put some ingredients in the slow cooker. You don’t need to pre-cook anything, because that would be rubbish. Mix it around a bit. 2. Turn it on (this really does need to be a step all on its own, otherwise this list of processes would just be far too short). 3. Wait for three hours. Take a bath or drink a bottle of wine or something. 4. Top the burrito bowls with grated cheese, avocado, sour cream, or whatever else tickles your fancy (this is the fun bit). 5. Eat (…okay, maybe this is the fun bit). See? Really couldn’t be any easier. You’ve got your beans, your veggies, your rice – all cooked together in one big yummy mix. Feel free to swap around the veggies depending on what you have in the fridge, add a bit more hot sauce if you like things spicy, use different spices to put your own spin on it. The slow cooker burrito bowl is your oyster. I kept my toppings pretty simple – some grated cheddar, fresh coriander (that’s cilantro, and it’s a must in my book), a dollop of sour cream, and some sliced avocado. You can add whatever toppings you fancy though, of course. Mexican food (even knock-off, untraditional Mexican food like this) has so many options when it comes to toppings, so go crazy. Salsa, guacamole, jalapeños, spring onions, a squeeze of lime… toppings for daaaays. To serve, your choice of: grated cheese, fresh coriander (cilantro), chopped spring onions, sliced avocado, sour cream, guacamole, etc. 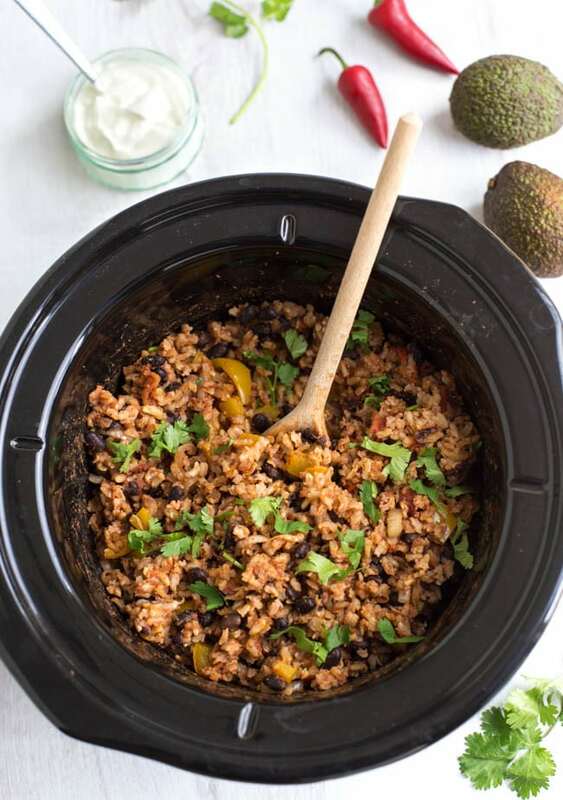 Add all the burrito bowl ingredients (not toppings) to a slow cooker - mine is 4.7 litres / 4 quarts. Mix well. Cook on low for around 3 hours, or until the rice is cooked *see note below*. Serve hot with your choice of toppings. Some people in the comments have found that their rice doesn't cook properly on the Low setting. If you're concerned about this or you're having trouble getting the rice to cook, try cooking on High instead. Note: Nutritional information is approximate, and will depend on exactly what ingredients you choose. Information above is for 1/4 o the recipe. Next Post » Amuse Your Bouche in the USA! Hello. 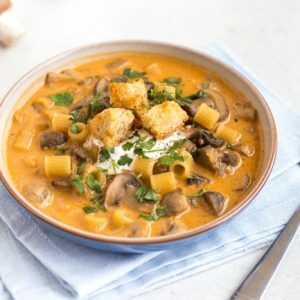 I’ve started making this in my slow cooker just a few minutes ago. I added about an extra half cup of rice, though. And some different vegetables. I added a tad bit more water to the mix, just by eyeballing. I’m wondering if the rice will still cook appropriately? Should the ingredients be just slightly covered by liquid? Entirely covered in liquid? I’m having trouble understanding how it should look while cooking, and I want to make sure I don’t have too much liquid or not enough. Thanks. Hi Angela, I can’t say for sure whether your version will cook properly, as you’ve switched up the quantities of rice and liquid. For an extra half a cup of rice, I would add at least an extra 1 cup of water. Hope it works out ok! Do you think it’d be okay to freeze this? I made way too much on accident (I did a little extra veggies and extra everything) and my husband is leaving for a work trip for the rest of the week. Thinking of just freezing portions for a later time? It was delicious! And I hate to be wasteful. I would probably check on it after 2 hours and see how it’s getting on – brown rice generally takes noticeably longer to cook than white :) Hope you enjoy them! 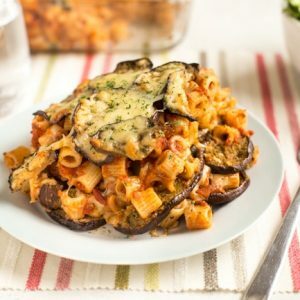 Ive literally just bought a slow cooker to try this recipie so I’m a little confused! If I cook it on high instead, do I have to shorten the amount of time? Or should I try a medium heat for the one suggested in your recipie? I’m sorry, I’ve never used a slow cooker before and I’m so exited to try this! Now that’s pressure!! Haha, I hope you enjoy it. Uysually, ou can’t always change the heat that things are cooked at in a slow cooker – the rice needs the time to cook through. Just like different oven temperatures – you can’t just boost the heat and cook something in half the time. Buuuuut, since some people have found that their rice doesn’t cook properly (I think it might be a difference in UK / US rice or something? Where are you from? ), some people have had success with cooking for the same amount of time on high. I’m in the UK and it worked fine on low with the rice we have here, but hopefully cooking on high will work for you if you’re in the US! 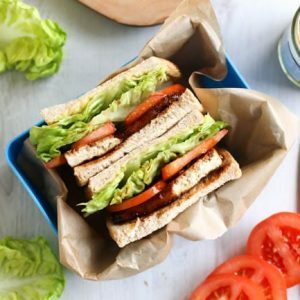 Thanks for this recipe – it’s really tasty! I couldn’t get black beans in the supermarket here in UK so substituted but otherwise followed the recipe. I use my vintage slow cooker (about 30 years old!) which cooks at a lower temperature so I can put it on low at lunch time and forget about it until dinner. That said, I had to top up the water a little. I was also told only ever to use “easy cook” rice in the slow cooker and have never had any problems with rice not cooking. Don’t know if there’s a US equivalent of that though! Thanks Debbie, glad you enjoyed it! :) You actually can get black beans in the UK (I’m British too! ), but for some reason they’re often in the world foods aisle rather than with the other beans. Trust me – they weren’t there and I didn’t have time to go to another! I’ve lived over half of my adult life outside the UK so am well used to substituting all sorts of ingredients:) The ‘world food aisle’ never fails to amuse when abroad… I remember finding a carrot labelled as exotic vegetable once! Ah ok, you can definitely find them in most supermarkets usually, maybe they were out. Yes the world foods aisle can be a bit random sometimes, some goodies in there though! Tried this for Christmas Day dinner… bad idea! I also could not get my brown rice to cook this way. Threw everything in the rice cooker and was much faster and easier. How strange, I think rice must be different in the UK! Reading the comments, and knowing that my rice requires a 2:1 ratio of liquid, I added extra liquid (about a cup more), and it made me question my interpretation of your ingredient list, which may be the issue for many. When you say “tin chopped tomatoes” I read that to mean some kind of diced tomatoes. Did you mean crushed or puree, which would be much more of a liquid? I guess when I look closely, I don’t see chunks of tomato in your pictures. You also say drained beans, but don’t say rinsed. Since I was using a can of no salt added black beans, I did that, and just shook them a bit in a colander to try to get some of the bean juice off, but it’ll still add some. I’m also starting it about 6 hours before I need it since some have had trouble with it cooking in time. My crock seems to cook pretty fast, so it may not be an issue, but I can always turn it off. It actually stays warm for several hours when off. This is what I mean by a tin of chopped tomatoes. Hi, when I say a tin of chopped tomatoes, I mean these – they’re chunky, but have a fair bit of liquid in them too. I don’t often rinse my tinned beans, but in this case I don’t think it will matter much either way. Hi! Did you use dry beans or canned beans. Thanks! I love the sound of the recipe but I HATE beans. I want to add lentils instead but I haven’t cooked them in the slow cooker before. Would they be ok in place on beans here? 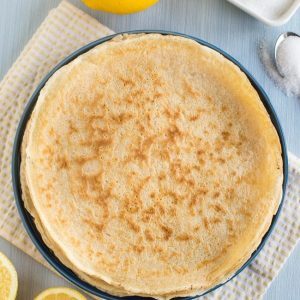 The texture would end up completely different, but you could definitely give it a go! I’d probably use brown or green lentils, as they hold up better than red. I had the same problem with the rice not cooking for 3 hours on low. I turned my crock pot to high and the rice cooked in an hour. It tastes great! I shall have to try this next time. It was tasty but after 3.5 hours the rice was still uncooked. Ended up adding more water and turning it up. It helped but I shall just start on high next time. I’m so sad. Last weekend I tried one of your recipes for the first time. 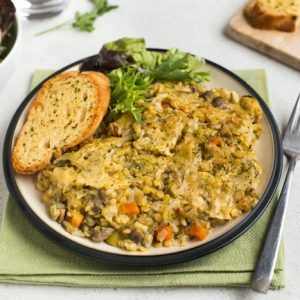 The cheesy lentil bake. It was wonderful! Today I tried this. I cooked it for 5 hours and my brown rice was still raw. I add an entire container of vegetable broth bc every time I checked on it all the liquid was gone. I like my rice less cooked too, but this was truly hard. Any tips? I don’t ever use white grains. I even used brown rice in the lentil bake and it worked. Do you soak your rice ahead of time? I’m so sorry Alli! 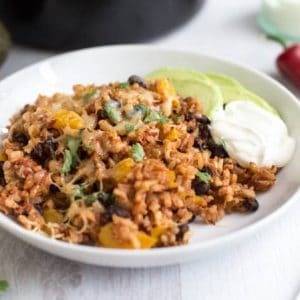 So many people have had success with this recipe, but a few people have had trouble getting their rice to cook in the slow cooker. I’ve made this several times and have never had that problem – I don’t know what the issue could be, other than that perhaps our slow cookers and / or the rice we used must be slightly different? I’ve made this multiple times and I can never seem to get the rice to fully cook. I use brown rice and I’ve cooked it on low for up to four hours with no avail. Any recommendations? A couple of people have said the same – so strange, I’ve never had any problems! I wonder if our slow cookers are slightly different, or maybe brown rice is slightly different from country to country?! You could just use white rice instead, but it will cook quicker, so keep an eye on it or you might end up with it going mushy. Also, brown rice is always going to end up chewier than white rice – do you have success cooking brown rice on the stovetop? I quite like the chewiness of brown rice but perhaps to other people it seems undercooked? Is the rice instant or regular whole grain? 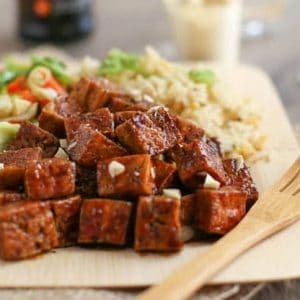 I bought whole grain assuming that would be better in a slow cooker, but with so many people having difficulty I’m wondering if quick rice was what you intended. Success! I cooked it on high as you recommended, and my rice cooked just fine. Thanks for the great recipe! I’m looking at your nutritional information, and I see 80.5 grams of carbs in a serving … Could that be correct? Hi Marsha, yes that sounds about right! That’s around a third of the carbs that an average person should be eating each day, and since this dish is rice-based, it makes sense! This looks great! 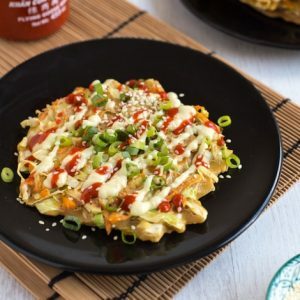 Would I be able to substitute the rice for quinoa? I imagine so! I’m not sure how long quinoa takes to cook in the slow cooker though, it’s probably a bit quicker to cook than rice, so just keep an eye on it otherwise it might turn to mush! How would you adjust this recipe for white rice instead of brown? Looks great! White rice will cook more quickly than brown, and it can go a little mushy in the slow cooker if you overcook it, so keep a close eye on it. I’d probably try cooking everything else for an hour and then add the rice for the last two hours? I haven’t tried it but I’m sure it’s easy, you’ll just need to watch the timings :) Enjoy! Yay! I’m so happy you and your boyfriend both enjoy these :D Thanks for the lovely comment, brightened up my morning! Came out perfectly and so yummy! Thanks again! I have now made this recipe twice in the last two weeks. It’s great and super easy. The only difference was because I don’t have an electric slow cooker, I used a cast iron Dutch oven and slow cooked it on the stove instead. It worked fine except I had to triple the water in the recipe. I also was able to fry off the veggies and spices before adding the rice and liquid and I added the coriander stalks along with the veggies just because I hate throwing food out (I don’t know if it made a difference to the taste but I felt very virtuous, so that’s something!). My rice didn’t cook! Left it on for 5 hours and it’s still hard :( any recommendations? Oh how strange, sorry about that! Was there plenty of liquid in the bowl? Perhaps your tinned tomatoes were less wet than mine, or something? I’d just add a tiny dash more water and keep cooking it until it’s done to be honest! Oh I just saw that you cooked it for an extra 2 hours. Really strange! As long as there’s a little liquid in the bowl and the heat was on, it should have cooked in 5 hours!! Maybe try it on high next time? I have had this same problem with other slow cooker recipes using rice. Not sure what the issues is. How strange! I have absolutely no idea why your rice wouldn’t be cooking… maybe your slow cooker doesn’t get quite as hot as mine? I can’t really think of any other explanation! So good. Made this last night. So easy! It barely felt like cooking haha. I was lazy and used the tin of kidney beans instead of preparing the dried black beans. Still worked well! Very tasty, got three thumbs up from the boys. Hehe yes it’s barely cooking – but that’s the best kind of cooking ;) I didn’t use dried beans either so no judgement here! I have made this twice this month already! We’ve used it in tacos, burritos, and as a base for Tempeh Picadillo. Delicious! Update: Spoke too soon. I noticed it says it yields for 3-4. What’s the size of the crock pot you’re using, though? I believe mine is a 4 quart. Would I be able to double or triple the quantities and be alright? Hi Reny, I think mine is 4.7 litres, which looks like it is around 4 quarts. To be honest I’m not sure you could cook enough for 15 people in a slow cooker that size – it would be full right to the top, and I’m not sure how evenly the rice would cook. It might take longer too – I wouldn’t want to promise that it would work if you scaled up the recipe so dramatically. You might be better off making a stove-top version like this, since you can watch it more closely and can be more sure that it will cook evenly. Thank you!! Those are both great ideas. 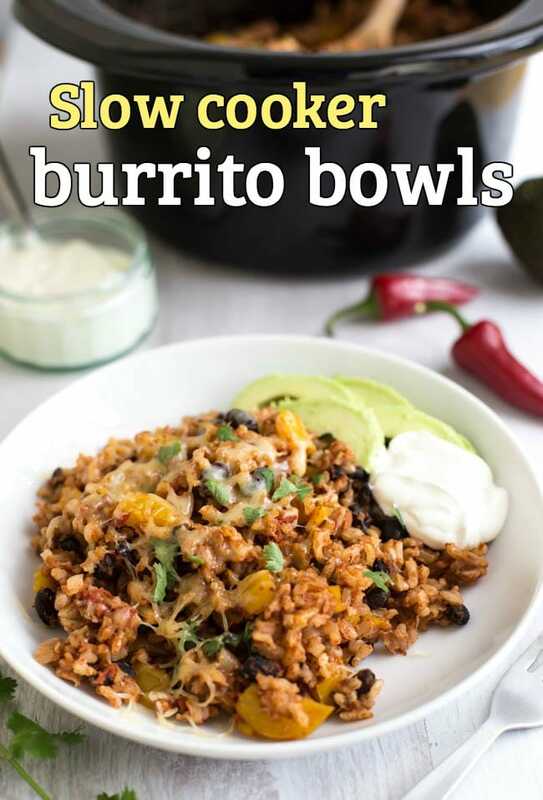 Love the idea that the burritos are made in a slow cooker! They look so good! I seem to use my slow cooker way more in the winter then the summer. I like to make soup when it is cold and if its rainy it’s a bonus! 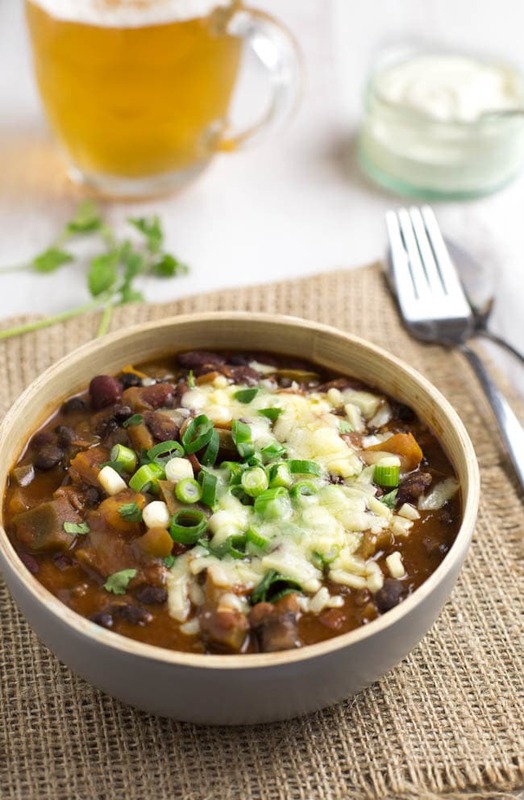 We are having a cold snap here in Maryland (USA) so I am using it right now and your black bean soup recipe is in it (with a few minor changes for things I did not have on hand or added lol)! I am going to try this recipe later this week, I think I can get the whole family on board for this one. This sounds like my perfect comfort food – oh boy. It may be spring, but I am so going to make this. Only trouble is, I have to root out my slow cooker from the back of the cupboard. My slow cooker stays on the counter because I use it so often :) I don’t have much counter space but it’s worth it! Oooh this looks delicious! I need to do more with our slow cooker, hardly use it nowadays! Oh God Becca, I LOVE YOU! This is just what I need to make now I am finally home from all my travelling about, I’m shattered, this is perfect! I always plan on making recipes I lust after on peoples blogs but I AM MAKING these. I slow cook all the time ..love a good lazy meal. This ticks all my boxes. Well, I can see why it’s a favorite! I pretty much want a huge plate of that right now! Anything with beans and a little spice is just fine by me! Great idea Becca… i’m going to have a whirl at this over the weekend as I reckon my husband would absolutely love it! anything that is Mexican and cooked in a slow cooker makes me very happy. This couldn’t be any simpler! I’ve actually never cooked quinoa in the slow cooker – I imagine it would cook a lot quicker, since the grains are so much smaller than rice? It’s definitely worth experimenting, but I imagine you could add the quinoa just for the last hour or so of cooking? I always find it amazing what you can make in a slow cooker. This really looks amazing Becca – it’s right up my street. Do you deliver? Ha! This looks very tasty. I bet it was. This sounds so tasty, I have to say I have never put rice in my slow cooker so really need to widen my cookery horizons! I’m wondering if soaked black beans would cook in this time, will have to investigate! Oh my gosh I am totally bookmarking this for later. Nom!! I never like Mexican food as much as I think I’m going to, and I still can’t work out why…. Being me, I would use dried beans, as it’s not much more of a faff to use them in that sort of recipe (you just have to remember to soak them for a couple of hours first, and then boil hard for 10-15 minutes before transferring them to the slow cooker), and I do prefer the texture. And I do love rice and beans…. I use my slow cooker A LOT, especially in the summer when I don’t want the stove on. Now I just need to work out a haybox version (no power source) to use in our motor home…. Rather what I was thinking…. Brilliant! Why wouldn’t you cook it in a slow cooker if you can – never even thought of it!! Whaaaat?! You must get your slow cooker out, it’s so handy! Try these!